The yawning inequality that has characterised Spain's slow recovery continues to drive its politics. Public pressure for a fairer distribution of resources has amplified sympathy for separatist issues, as in Catalonia's recurrent votes for independence. The central government has previously prevented Catalonia from augmenting its public spending locally, in order to conform to EU surplus mandates. Catalonia maintains a distinctive regional identity and demands for autonomy have increased since the 2008 financial crisis. The region is a net contributor to the Spanish budget, accounting for nearly 20% of national GDP. Its latest independence referendum took place in October 2017. Following public approval of the measure, Catalonia declared self-rule on 27 October, prompting the Spanish government to impose direct control as Catalonia's leaders, including Carles Puigdemont, sought legal protection in exile. Mr Puigdemont maintained that he was the legitimate president of an independent Catalonia after Madrid took control of the region. Spain’s prime minister, Mariano Rajoy, called fresh elections and urged the national government’s Catalan supporters to turn out in force to vote on 21 December. Businesses have also increased pressure on Catalonia by relocating from Barcelona, Spain’s primary economic hub, to Madrid. Over 2,000 firms have announced plans to move since October, including Gas Natural and Caixabank, the country’s third largest creditor. This compares to Barcelona’s loss of some 3,000 companies between 2008 and 2015, underscoring waning confidence in response to successive votes for Catalonian independence. Related disruptions are expected to crimp Spain’s overall growth figures into 2018. Further afield, Catalonia’s cause has won few followers in Brussels, as Spain’s internal sovereignty dispute has awkward implications for other separatist regions within EU member states. The EU has yet to articulate a general position on breakaway areas. It has described the Catalonian conflict as a domestic political issue and will aim to keep other European regional campaigns for increased autonomy off its agenda. Nevertheless, the Spanish standoff highlights European operational risks in separatist areas, as well as the political puzzle of accommodating regions whose claims to nationhood are older than those of the modern states they inhabit. In addition to political instability, these conflicts can curtail revenues. 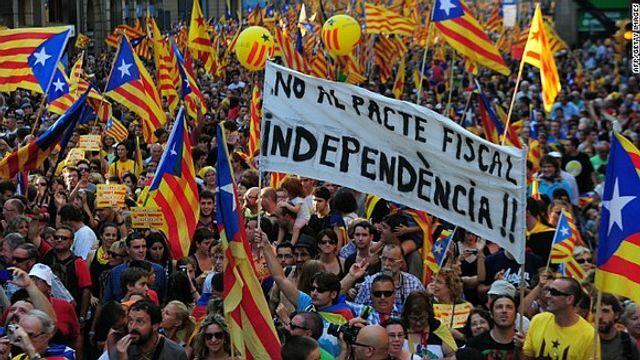 In the unlikely event that Catalonia emerges from this dispute with independence, it will also do so with depleted coffers.